Exercise Diamond Shield 2019 has seen the successful integration and operation of Australia’s F-35A Lightning II with HMAS Brisbane and Melbourne off the coast of Newcastle. Throughout the exercise, Brisbane and Melbourne contributed to high-end warfare activities as part of the Royal Australian Air Force's Tier 1 air defence exercise, Diamond Shield. Brisbane embarked three Fighter Controllers from the Fleet Fighter Control Element, who had the opportunity to control a range of aircraft including F/A-18F Super Hornets and EA-18G Growlers, with up to 30 assets airborne at any one time. Navy said that a "highlight of the exercise saw the most modern and advanced air warfare platform in the Royal Australian Navy integrate and operate with Australia’s new fifth-generation fighter, the F-35A Lightning II". Lieutenant Kyle Livingstone, one of the Flight Controllers, said the exercise was a "great opportunity to prove the capability of the Navy’s new destroyers in a complex environment with the most modern and advanced platforms in the Air Force". “Exercise Diamond Shield showcased what’s possible when combining the lethality and advanced capability of the Navy’s Air Warfare Destroyers with fifth-generation fighter aircraft,” LEUT Livingstone said. “Achieving the first integration of the Destroyer capability with the fifth-generation Joint Strike Fighter is of particular significance," said Commanding Officer of HMAS Brisbane Commander Josh Wilson. 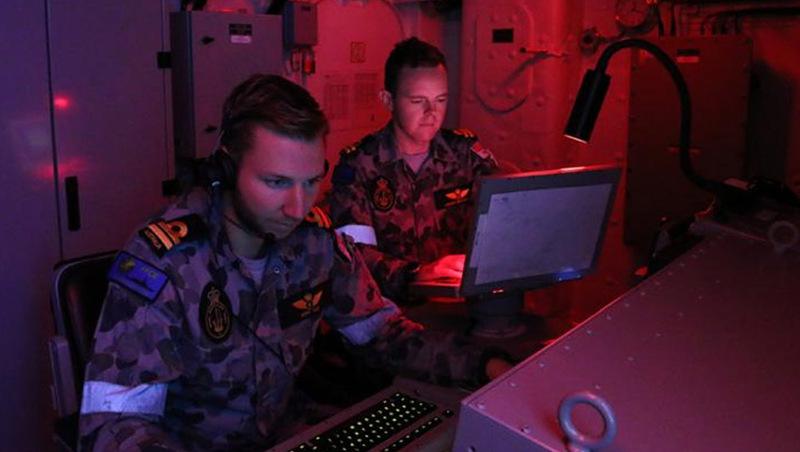 “The opportunity to integrate cutting edge air and maritime assets in a high-end warfighting scenario is rare and proved an invaluable experience for the Brisbane team." The Fleet Fighter Control Element "seamlessly integrated" into Brisbane's operations room team, which demonstrated "the ease with which Fighter Controllers contribute to high-end warfighting activities". Brisbane's participation in the activities form part of her deployment readiness work as she prepares to conduct weapon firing and certifications in the US later in 2019.